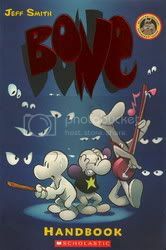 The Bone Handbook is just what it sounds like, a source book of information concerning Jeff Smith's Bone. Printed as a companion to the Graphix/Scholastic reprints of the series, it is written in a slightly juvenile fashion, but that's because the Graphix/Scholastic versions have been marketed towards a younger audience. It still makes for a good refresher on what happens in the series and who the characters are. It's a really quick read, but fun all the same. If you are a fan of the Bone series, I'd say you'd probably enjoy this, just as a reminder of what went on in the series. It is a little spoiler-filled, so if you haven't read the series yet, be warned that this will give some of it away.